I have always been a lover of the dark. Call it the New Orleans in me. But that doesn’t mean that it was all vampires and ghosts all the time. As I child I can remember watching the show Cheers with my mom. Everyone would smile, both on and off screen, whenever Norm would walk in and the bar would erupt with “NORM!” That sense of belonging and the village coming together, even in the heart of the big city, warms even the most distant heart on a cold Boston night. Isn’t that right, Dr. Frasier? In New Orleans, a big city in its own right, people are extremely loyal to our regular spots. The holes in the wall that become a part of home. It’s why we loved the Saints even when they were the Ain’ts and a lot of chains have so much trouble staying alive. I still don’t think the city has forgiven Rite Aid for taking over the K&B spot when I was a kid. Being a true child of my hometown, I love finding my spots. Plus, once I’ve found them, I stick to them even way up here in the frozen north of Maryland. Today, my Cheers isn’t a bar. My favorite routine spot is a little hole in the wall Greek restaurant: Greek Aroma. This place drew me in because it is amazing. For such a small venue, they serve the freshest and cleanest food. I have brought people in from out of town there all the time, not to mention the locals, and everyone loves the food. But for me, it’s more than that. Good food is of course key to any successful restaurant (and this place is successful with people there waiting from open through all afternoon) but what made this my place, my regular place, is the people. The people there are so friendly. Especially the main manager, her smile could power a city and her open and welcoming nature makes you feel at home even on the roughest of days. 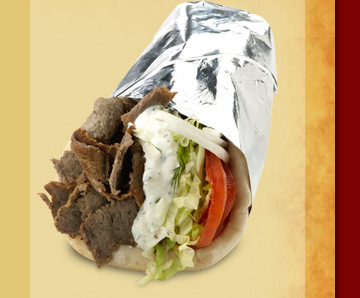 The combo of the two…they had me at gyro. This is a job for a Super Gyro. Comes with his own cape. Here, I get to feel that warmth deep inside when I walk in and am greeted with cries of recognition. Often, my order is put in before I ever make it to the counter. I may never be rich and famous, but for this one place to remember me from the hundreds that eat there every day. I want to go back for that as much as the food. But this got me thinking about routine. People each have their own places. They may not have “Norm” moments, but a place they make a part of their everyday lives, giving them that same sense of comfort and belonging. It could be a coffee house or a restaurant or the gym where other “strangers” comment on your progress and keep you going on the hard motivation days. We are social creatures (even the introverts) and thus even if it is just a person or two, we enjoy a momentary easy connection. So why do so few written characters have these places. Where does Bruce Wayne stop for coffee on the way to Wayne Enterprises after a long night of vigilantism? Does Jean Grey have a quiet bar she goes to when Cyclops is just being too much of a jerk? We see regular hangouts in sit coms because it’s easier for set design, but what about in books for character design. The few times I’ve seen it in books, a character having a “place” (not their job space or their home space) where they felt safe, really made that character much stronger to me. Thus, a new space in my book world is born. They say don’t piss off a writer, or they’ll kill you in their book. The reverse is also true. One of the highest honors a writer can give someone is to write them well in their book. So, Greek Aroma, my place, has inspired me to create such a space in my series. Rowan has just developed a taste for Greek. This entry was posted on Monday, October 19th, 2015 at 11:57 am	and posted in Dark, Interviews, medium, New Adult, Of Scions and Men, Scions of Wrath, shifter, Update, Urban Fantasy, vampire, Writing Process. You can follow any responses to this entry through the RSS 2.0 feed.